Welcome To The Step Stool Chef! Quesadillas are a fan favorite in our home. They are quick & easy to make and a perfect “anytime of the day” kinda food. In this Chicken & Broccoli Quesadilla recipe, not only will we show you step-by-step instructions for your little chef but we will also share how to make it using a toaster oven ! Plus, this recipe for is a great way to add veggies in a way kids will enjoy. The great thing about this recipe is that its uses 4 simple ingredients: Tortillas, pulled chicken, cheese & broccoli. We had chicken and broccoli the night before so I was excited to find a new use for these leftovers. The key is to cut down or tear the broccoli into smaller florets to make it easier to add to the recipe. Make this recipe even easier by using a rotisserie or leftover chicken from a previous meal. Assembling the quesadilla is easy as 1, 2, 3. 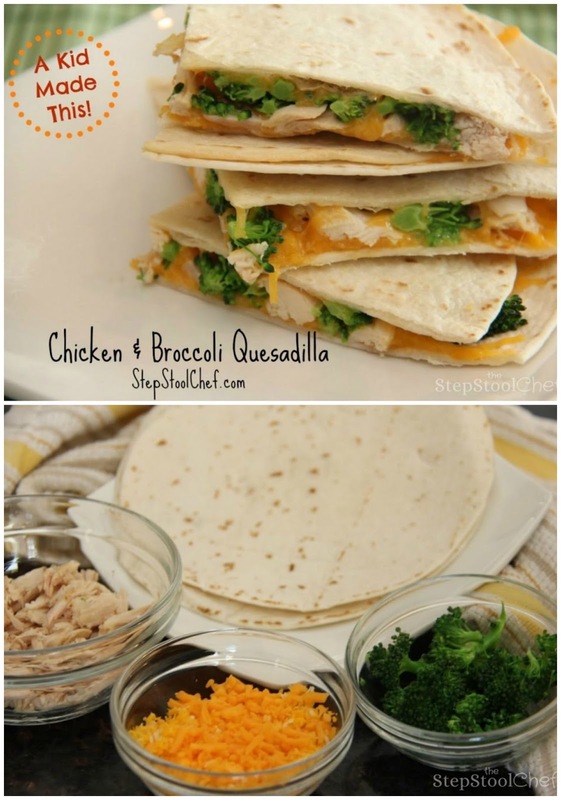 Simply layer on the cheese, chicken and broccoli on top of one tortillas. Once you have your ingredients layered with your preferred balance of chicken, cheese & broccoli simply cover it with the other tortilla. For this recipe, we used a toaster oven to make the quesadilla. We wanted to share a fun way that little chefs can make their own quesadillas without the worry of standing over a hot stovetop. Simply place the quesadilla on the pan and cook at 350 degrees for 10-15 minutes. Halfway through, my little chef wanted to flip the quesadilla to make sure both sides were evenly toasted but this step is completely optional depending on your and your little chef’s comfort level. Keep reading for a great safety tips for kids cooking with toaster ovens. Trackback from Mini Pizza Tacos!